A number of Nigerian and Africans were beaten up in New Delhi, India during a candlelight march for a 17-year-old boy who died on Saturday evening. 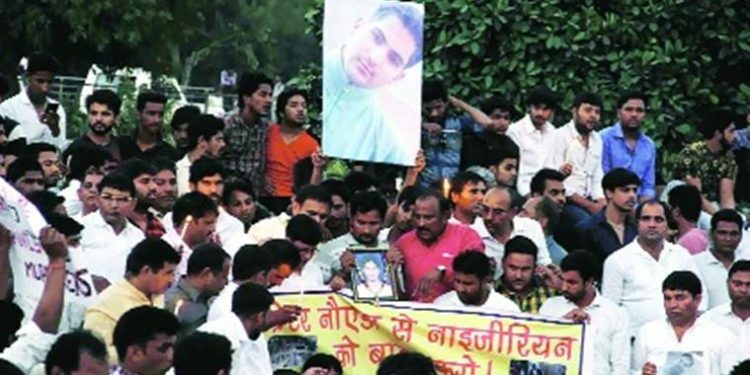 Indian Express reports police disclosed the Class XII student had allegedly died of a drug overdose, following which his family accused their five Nigerian neighbours of murder and demanded their arrest. Police said around 7 pm, four Africans who were near Ansal Plaza in Pari Chowk area were attacked by residents while the windscreen of one of their cars was smashed. Meanwhile, an association of African students residing in the area issued alerts to the community, asking them to stay inside. “All African students residing in Greater Noida and its environs are hereby requested to stay at home for their safety as there is a serious mob attack against African students living there,” read a message from the Association of African Students in India. Meanwhile Indian authorities has today ordered an investigation into a mob attack on the African students near New Delhi, a crime for which seven people have been arrested.